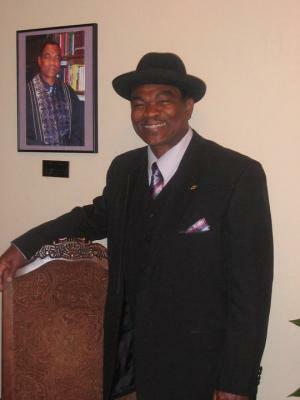 Bishop Albert Ervin Jr. was born on November 10, 1946 in Jackson,TN to Albert Lee and Estelle Ervin. After the death of his mother, he and his siblings became foster children to their uncle and aunt Leroy and Dottie Jones who reared them in the town of Humboldt, TN. Bishop Ervin attended and graduted from Stigall High School in Humboldt, TN in the year of 1965. Prior to graduating from high school, he met Effie Mae Hamilton in April of 1968. They were blessed with three children: Carla Alphia, Albert Jonathan, Michael Anthony Ervin. In February 1966, Bishop Albert Ervin, Jr was drafted into the U.S. Army serving two years receiving the rank of E-5 Medical Specialist. He was Honorably Discharged in January 1968. He attended Lane College until God called him to evangelize. He continued his studies in Religion with The Voice of Deliverance Ministry completing that course of study to become a licensed minister on March 3, 1977 by the International Offices in Dallas, TX. He later completed and received an Honorary Doctor of Divinity Degree on January 28, 1982 from The Voice Deliverance Bible College, affiliated with Kings Way Bible College of Des Moines, Iowa. At the tender age of 5 years old, Bishop Albert Ervin received his known encounter with God through a dream where God revealed Himself unto him. His first acknowledgement of his call to the ministry was in 1963 when he was in the 10th grade. He waited on his ministry and received his first appointment by the Church of the Living God in Chicago, Illinois on August 15, 1967. In the early 1970's, he co-pastored the J-E-S-U-S Broadcast Radio Ministry. During the 1970's, he became a fulltime Evangelist. In the year of 1975, he founded the Gospel Shout Outreach Ministry expanding from home prayer meetings to establishing his first initial church in a little store front building at 431 North Royal Street, Jackson, TN. In the year of 1980, Bishop Ervin relocated from North Royal to 1425 East Chester and started the Gospel Temple Holiness Church under the Gospel Shout Outreach Ministry. The city of Jackson received a devastating tornado in the year of 2003 and left the building unrepairable. Even though the tornado destroyed the church building but not the church body, because Gospel Temple became a mobile ministry until the Lord blessed us with another church building on 40 Colorado Street in 2006 to present. Our beloved Bishop Ervin was called home to be with our Lord and Savior on June 28, 2010. Before leaving this earthly body, Bishop Ervin laid the foundation for the torch to be passed on to our now beloved Pastor Elder Darrin L. Theus.